Do your cheeks look sunken or hollow? Are your lines and wrinkles too deep for Botox® ? Do you want fuller lips to match the rest of your features? With ageing, not only do we lose volume from the skin, but we also lose volume from the fat pads in the face and also the bones. 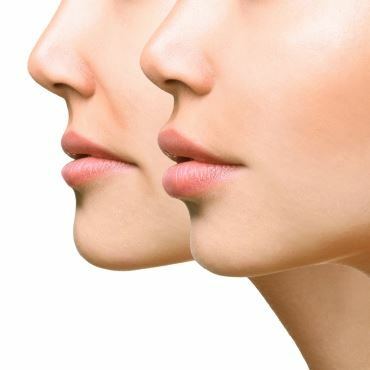 As a result, your cheeks can start to look sunken and flat, folds start to appear between the nose and mouth (Nasolabial fold) and from the corners of the mouth (Marionette lines), and jowls start to appear. This is where dermal fillers come in. They can be injected into various areas to give structure and definition and increase volume. Using them selectively as you get older, it’s possible for you to subtly and positively manage the way you look over time, so you will appear healthy, full and youthful whatever the date on your birth certificate. Most dermal fillers are made of hyaluronic acid (HA) which is a natural component of the skin. They come in various densities, and these are designed to be injected into different depths to replace volume at different levels. There are many different brands of fillers. The most common brands of HA fillers are Belotero, Juvaderm, Restylane and Teosyal. Depending on where we want to increase volume, an appropriate density filler is chosen for that area. For example, for the lip enhancement in the photos below, we have used only 1ml of Belotero Balance to produce a subtle increase in volume and definition. The lips are bigger but still look natural. When you visit the Skin Aesthetics clinic for your full 45-minute consultation, Dr Qian will discuss your areas of concern and medical history with you to assess whether this treatment is suitable for you. Dr Qian always takes a holistic approach and aims to achieve the best results for you. This may mean having a combination of different treatments which work on different parts of your face. Following your consultation, Dr Qian will design a customised anti-aging treatment plan to achieve the look that you desire. At your consultation, you’ll be able to discuss the different types of dermal fillers available, how they could work for your skin condition, what to expect from the process and results, and how to care for your skin before and after your treatments. You will have the opportunity to discuss any questions you have. If you decide that dermal fillers are not for you, you do not have to go ahead with the procedure. What happens at my dermal filler session? Dr Qian will offer you a local anaesthetic in cream or injection form. For some areas, the skin does not need to be numbed because the fillers also contain local anaesthetic. The dermal filler will then be given in a series of small injections. Dr Qian may massage some areas if needed. Treatment times range from 30 minutes to one hour. How does it feel to have dermal fillers? According to patients, having dermal fillers feels slightly uncomfortable but tolerable. Some areas, such as the lips, are naturally more sensitive than others. What happens after I’ve had dermal fillers? You may experience slight redness, tenderness and swelling for a couple of days. You should not massage the treated areas, and do not apply makeup for at least six hours. Avoid drinking alcohol, excessive exercise and steam rooms or saunas for 12 hours. To help the fillers last longer, you should wear a good sunscreen (minimum SPF 30) every day and avoid sunbathing. It is important to have a good skincare routine to keep your skin looking youthful, as the dermal filler will not affect the quality of your skin. Dr Qian will discuss this with you during your consultation. This depends on the treatment area, how much filler is used, the density of the filler used and the amount of UV exposure. Lip fillers usually last 3-6 months, while other areas such as the cheeks and chin can last up to 18 months. There is no definite rule on this, so you can have more whenever you feel that the effects of the previous filler treatment has worn off. We will always do a full assessment of your face before any treatment, and you will not be treated if we feel that you don’t need any more fillers at that time. Can I have different fillers in the same area? Although most fillers are hyaluronic acid fillers, there are some that stimulate the body to produce more collagen and fibrosis. It is always a good idea to find out which filler you are being treated with. Having different brands of hyaluronic acid fillers in the same area is not usually a problem, but different types of fillers should definitely not be mixed within a short space of time. Can I become allergic to the filler? Allergies to fillers are generally very rare, and those that appear to be allergic are usually allergic to the local anaesthetic in the filler. If you have had a reaction following a dermal filler treatment in the past, you should not have any more fillers in the future. If you know that you are allergic to local anaesthetic, we can use dermal fillers that do not contain local anaesthetic. We always have an emergency kit in case of any severe allergies. Can the filler be removed if I don’t like the result? Hyaluronic acid can be dissolved with the enzyme hyaluronidase which is part of our emergency kit. Using hyaluronidase is associated with its own complications, so we would not usually use it unless in an emergency. We follow the principle of ‘less is more’, and would rather under-treat than over-treat. Having said that, it is possible to dissolve badly injected HA fillers which you had in another clinic to return the treated area to its normal appearance.